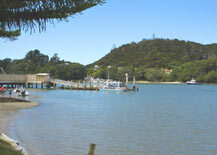 The stunning Coromandel region is an extremely popular holiday region. From the fabulous golden sand beaches with magnificent coastal scenery, to the dense native forest, the beauty of The Coromandel is inescapable. The Coromandel includes main centres Thames, Whitianga, Whangamata, Paeroa, Waihi, Pauauni and Tairua. In the nineteenth century the peninsula teemed with human activity associated with the exploitation of timber, gold and kauri gum. Today many holidaying activities reflect on history of the region. Located in Whitianga is The Mercury Bay Museum which houses fascinating displays on Caption Cook, Maori artefacts, kauri gum, minerals and local shipwrecks. There is an abundance of walking tracks on the Coromandel Peninsula that are maintained by DOC and cater to all fitness levels. Walk through the regenerating kauri trees to see the remains of old saw mills and relics from the former gold mining. Not to be missed is the spectactular sight of the ancient kauri, some of which are estimated to be over 1200 years old. 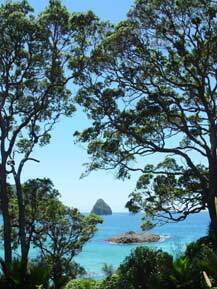 The Coromandel has many sheltered marine reserves ideal for snorkling and diving. One of the most notable of these is the Te Whanganui-A-Hei (Cathedral Cove) Marine Reserve which extends from the northern end of Hahei Beach. Whale watching and dolphin swimming are popular holiday activities in The Coromandel. Fishing, especially big-game fishing for the likes of tuna, marlin and mako sharks is also very popular. Hot Water Beach Recreation Reserve is located a few kilometres south of Hahei. Thermal water bubbles up through the sand two hours either side of low tide. Here you can dig your own personal hot pool right next to the sea. The links below will help you guide your search through all the information on KiwiWise regarding one of New Zealand's most popular holiday regions, The Coromandel.